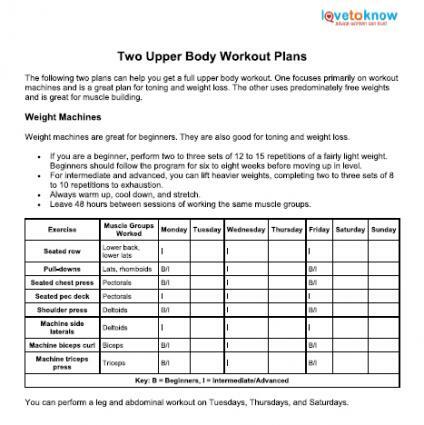 Click to download upper body workout plans. If you want to give your upper body a little extra tone and definition, you need to hop off the cardio machine and hit the weights for an upper body workout. When you target this area, you hit the major muscle groups, including your back, chest, shoulders, biceps and triceps. Once you start your upper body workout plan, you'll be surprised how quickly you begin to see sleeker, stronger muscles. Choose a heavier weight or resistance level so that when you perform a 10 to 15 repetition set where the last one or two repetitions are almost too difficult to perform. Choose a lighter weight or resistance level, and continue performing repetitions until the last one or two repetitions are almost too difficult to perform, even if it means performing 20, 30 or more repetitions. Either way, you want to work your muscles to near-exhaustion on every exercise in order to continue seeing results. If you need help downloading the printable plan, check out these helpful tips. Perform one or two sets of a lat pull-down and a seated row. These two exercises will target the major muscles of your back, including your latissimus dorsi, trapezius and rhomboids. The back muscles are so intricately intertwined with the arm and shoulder muscles, that you'll also work your biceps and shoulders. Lat pull-down: Sit on the lat pull-down machine and choose a resistance level from the stack. Grip the lat bar so that your hands are slightly wider than shoulder-width apart. Lean back slightly, keeping your torso straight. Squeeze your shoulder blades together and pull the bar down to chest-height. Return the bar to the starting position and repeat. Seated Machine Row: Sit on the seated row machine and choose a resistance level from the stack. Adjust the machine's seat height and chest pad so that you're sitting upright and straight with the pad touching your chest and the machine's handles at chest-height. Grasp the handles and squeeze your shoulder blades together as you pull the handles to your chest. Return the handles to the starting position and repeat. Like the back, the chest muscles work in unison with the arms and the shoulders to perform most movements. While performing the pushup and dumbbell fly exercises, you'll also work your triceps and shoulders. Perform one or two sets of each exercise. Pushups: Perform a pushup by starting on your hands and toes, your body in a straight, "tabletop" position. If you can't support yourself in this position, lower your knees to the floor. Bend your elbows and lower your chest toward the ground, keeping your body straight. When your elbows form a 90-degree angle, push yourself back up to the starting position. Continue the exercise until you can't perform any additional repetitions. Dumbbell Fly: Lie on a bench with a dumbbell in each hand. Extend your arms directly over your chest, your palms facing in. Keeping your arms relatively straight, extend them out to the side, until they're just shy of chest-height. Push them back up to the starting position. Continue performing the exercise. You can regularly mix up your shoulder routine, trying shoulder presses, lateral raises and front raises, but because you're already working your shoulders as you work your chest and back, you really only need to supplement your workout with a single shoulder exercise. Perform one to two sets of the shoulder press exercise during your initial workout. Shoulder Press: Hold a dumbbell in each hand at shoulder-height, your palms facing away from your body. Press your arms directly up over your head, stopping just shy of locking your elbows. Lower the weights back to the starting position and continue the exercise. During your upper body workout, you'll want to isolate the biceps and triceps with at least one exercise each. Perform one or two sets of a basic dumbbell curl and an overhead triceps extension. Dumbbell Curl: Stand with a dumbbell in each hand, your arms at your sides and your palms facing forward. Keeping your elbows close to your sides, curl the dumbbells up to shoulder-height, then return them to the starting position. Continue performing the exercise. Triceps Extension: Hold a single dumbbell in both hands over your head, your palms pointing toward the ceiling. Keep your elbows from splaying outward as you bend them and lower the dumbbell behind your head. When your elbows form a 90-degree angle, press the dumbbell back up to the starting position. Continue performing the exercise. The following two plans can help you get a full upper body workout. One focuses primarily on workout machines and is a great plan for toning and weight loss. The other uses predominately free weights and is great for muscle building. Weight machines are great for beginners. They are also good for toning and weight loss. If you are a beginner, perform two to three sets of 12 to 15 repetitions using a fairly light weight. Beginners should follow the program for six to eight weeks before moving up in level. For intermediate and advanced, you can lift heavier weights, completing two to three sets of 8 to 10 repetitions to exhaustion. Always warm up, cool down, and stretch. Leave 48 hours between sessions of working the same muscle groups. You can perform a leg and abdominal workout on Tuesdays, Thursdays, and Saturdays. These routines primarily use free weights, although it may include some machines as well. Follow the beginner and intermediate routines above for six to eight weeks each before engaging in this program. Work with an experienced weight lifter or personal trainer when you start with free weights to ensure you are using proper form. Perform two to three sets of six to eight repetitions to exhaustion for each exercise. Additional exercises are included for advanced lifters. Perform the intermediate routine for six to eight weeks before moving on to the advanced routine. Leave 48 to 72 hours between working each muscle groups. Perform these exercises at least two times per week. Perform leg, abdominal, and lower back exercises on alternate days. You can also work legs, lower back, and abs on the same day you work your back and biceps. Every three to four weeks, substitute or supplement your routine with new and different exercises. The more you challenge yourself, the better results you'll see. You can even keep things interesting by adding equipment like stability balls, medicine balls, kettlebells, exercise bands and steps to your workout. Above all else, stay consistent with your routine, working your arms at least twice a week.